Is 2016 the year you'll travel to Northern California wine country? 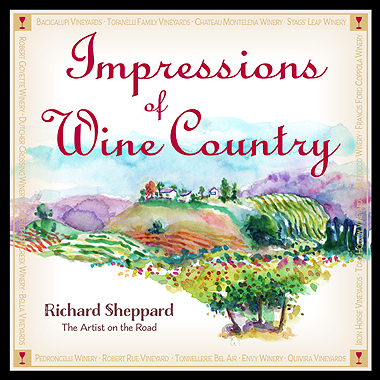 If you'd like to but can't, you can do what I did: Be an armchair traveler via Richard Sheppard's Impressions of Wine Country. Then when you actually make travel plans, you'll have the advantage of the "insider's" perspective. Wine aficionados will appreciate Richard's talks with some the region's winemakers and growers. Watercolor is my favorite medium, and Richard is a master of the medium, capturing people, animals, buildings, plants, food, wine, everything, in a way that pulls you right into the scene. He takes us through the year, month by month, introducing us to people and places through well-told stories as well as more than 170 vivid watercolors. readers anywhere in the world! I've been a fan of Richard's work for several years since I discovered The Artist on the Road blog, and I was so glad to be able to have a book to hold in my hands and enjoy away from my computer. Hmm ... perhaps sipping a glass of wine in the gazebo while I dream of Napa Valley and Sonoma. The book might make you envy the artist and his life in wine country, but it might also ignite in you the desire to look at wherever you are with a fresh eye. Even if we don't draw or paint, art is a way of looking at life; and we can all do that! Wineries mentioned and/or pictured include: Bacigalupi Family Winery, Bella Vineyards, Benziger Family Winery, Chateau Montelena Winery, Chateau St. Jean, Christopher Creek Winery, Duckhorn Vineyards, Dutcher Crossing Winery, Envy Winery, Francis Ford Coppola Winery, Glen Ellen Winery, Imagery Estate Winery, Iron Horse Vineyards and Winery, Joseph Swan Vineyards, La Crema, Limerick Lane Winery, Lyeth, Mazzocco Winery, Pedroncelli Winery, Quivira Vineyards and Winery, Ridge Winery, Robert Goyette Winery, Robert Mondavi Winery, Stag's Leap Wine Cellars, Toad Hollow Winery and Tofanelli Family Winery. This giveaway is open to readers anywhere in the world who are 18 years of age or older. Leave a comment below (one entry per person, please) and please include your email address in the body of your comment. Must enter by 11:59 p.m. Eastern time Wednesday January 6. Winner will be chosen by random drawing and be announced here in the comments before noon Eastern time on Thursday January 7. If I don't hear back from the winner of the random drawing by noon Eastern on Sunday January 10, another drawing will be held and a new winner selected from the original entrants (those who commented before the giveaway deadline). Disclosure: The artist/author is providing the book for this giveaway. I have received no compensation. The views expressed here are entirely my own. As always, I tell my readers what I really think! Hors d'oeuvre--which I just call HDs because, let's face it, nobody, myself included, can pronounce it--get short shrift at Delightful Repast because I don't give a lot of Smart Little Drinks Parties. But here are three of my tried-and-true HDs and three more from some blogger friends. 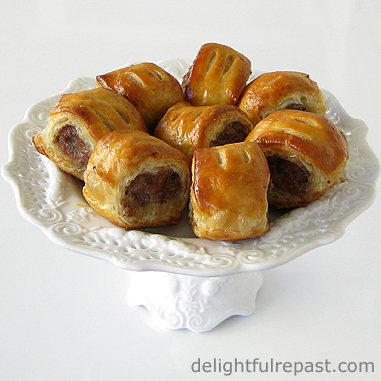 Sausage Rolls (below) are a British classic. I recommend my Ruff Puff (quick puff pastry) for them. Make lots because, whether they are "in" or "out" at a particular time, everyone loves them! Sausage Pinwheels (the top photo) were made with my homemade sausage, but you can use any sausage you like. Sometimes I make my own puff pastry and other times I use a good frozen puff pastry. The following three are from three of my favorite food bloggers. And you'll find nine more at my previous Cocktail Party Foods post, for a grand total of 15. So let's get this party started! What is your go-to "signature" HD? Always offer plenty of alcohol-free beverages. 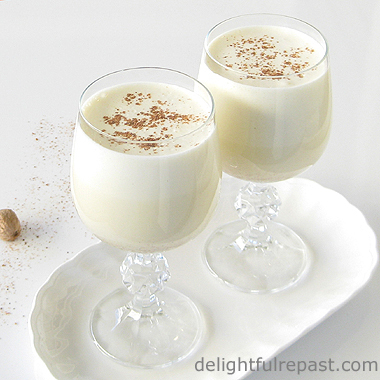 For winter parties, might I suggest my Eggnog? You can make one pitcher with brandy (or other alcohol) and one without; or just leave out the alcohol and add a bit to individual servings for those who want it. 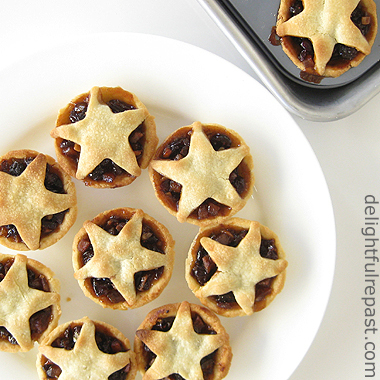 If you made the Mincemeat last week and got your mince pie tin, you're ready to make Mince Pies! The Mincemeat recipe makes enough for four dozen of the pies, but I just make them a dozen at a time; so my pastry recipe below is formulated to make just enough pastry for a dozen. If you have a bit leftover, just save it for the next batch or bake it as cookies. Mr. Delightful isn't crazy about mincemeat, so I'm going to make a batch of mince pies for him that are half mincemeat and half finely diced apple. If he doesn't like that, I guess I'll have to accept the fact that he's just not a mince pie kind of guy! 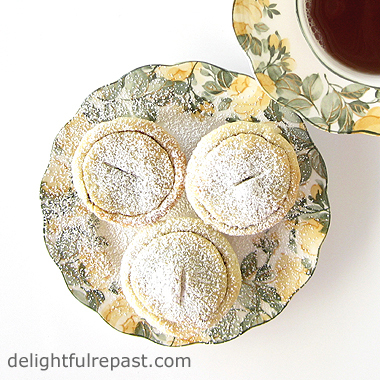 A popular holiday season treat in the UK, mince pies are wonderful all winter or anytime of year. They would be perfect for an afternoon tea, but I'm not going to have time this month or next to give one. 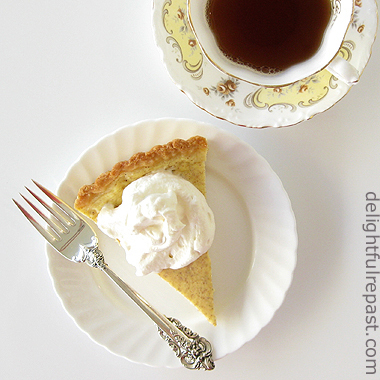 A trio of them make a delightful after-dinner dessert with coffee or tea. The pastry is easier than regular pie crust, in that it is a shortcrust, rather than flaky, pastry. You really don't have to worry about chunks of butter, keeping everything cold, not handling it too much, etc. Just make it quite carelessly, rolling and re-rolling all you want. You really can't mess it up. Mince pies are good at room temperature, but they are grrrrreat warm. Never serve them cold. If you're making them ahead, just pop them into a preheated 350F/180C/Gas4 oven for about 5 minutes. You'll be glad you did! * It depends on how full you fill your pies. I use about 1 1/2 tablespoons per pie. 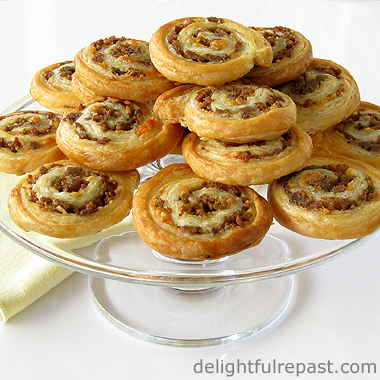 1 You can easily make the pastry by hand, but here are directions for food processor method. Add flour, powdered sugar and salt to work bowl of food processor; turn on for about 3 or 4 seconds to combine. Add chunks of butter; pulse to a crumb texture. Add egg yolk and water; pulse until the dough starts clumping together. This is to be a crisp, more cookie-like crust, rather than a flaky pastry; so there's not quite the concern about over-processing. Flatten slightly into a 4- to 6-inch round disc, wrap and refrigerate for 30 minutes. 2 On a very lightly floured sheet of baking parchment, roll out all the dough, for both tops and bottoms, about 1/8 inch/3mm thick. Cut 3-inch/8cm rounds for bottoms. 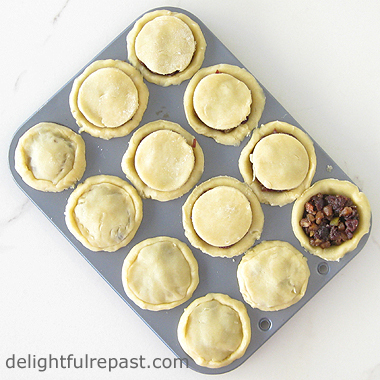 OR Before rolling out the pastry (for just the tops), use a #60 (1 tablespoon) scoop and place a scoop of dough in each of the 12 cups of the mince pie tin. With your thumbs, press the pastry in each cup. 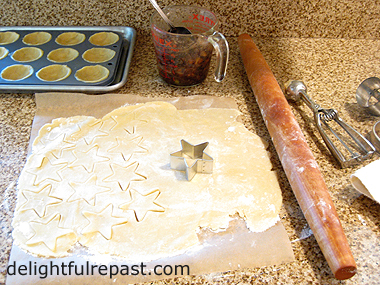 Roll out remaining pastry on a lightly floured sheet of parchment, and cut out either stars or circles about 2 to 2.25 inches/5 or 6cm in diameter for the tops. 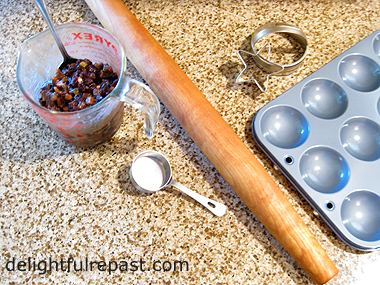 3 Put about 1 1/2 level tablespoons of mincemeat in each of the 12 cups. Top with pastry. If using round tops, crimp the edges and cut a slit to allow steam to escape. 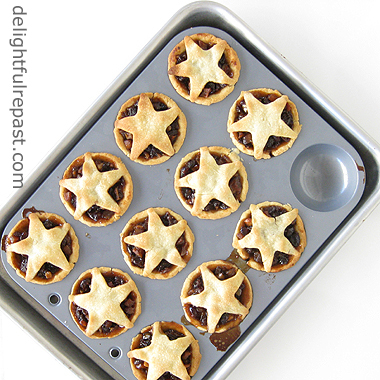 If using star tops, just lay them on and press the points against the edge of the bottom pastry. Note: Save any leftover pastry for another batch or another use. You can even bake it as not-too-sweet cookies! 4 Preheat oven to 200C/400F/Gas6. 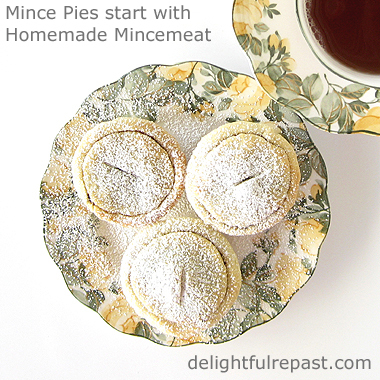 Place mince pie tin in a rimmed baking sheet. My pan fits perfectly inside a 13x9x1-inch quarter-sheet pan. Bake until pastry is golden brown, about 20 minutes. Cool. 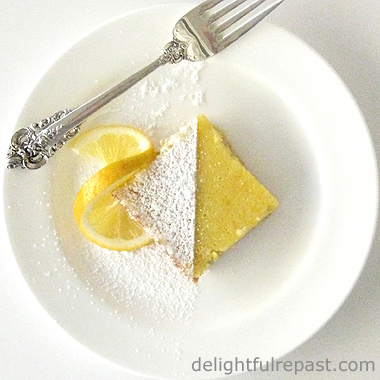 Serve slightly warm or at room temperature with a dusting of powdered sugar. My mincemeat recipe makes enough for a regular 9-inch pie; but as much as I love my homemade mincemeat, a big slice of pie is just too much. 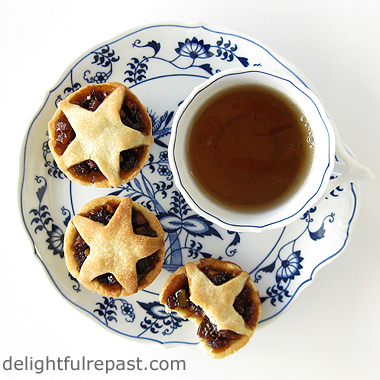 That's why I make the lovely little mince pies of my childhood that are so popular in Britain this time of year. You can make-do, I suppose, with muffin or mini muffin tins; but I recommend getting a proper mince pie tin. So order your tin, then make the mincemeat. It needs to mellow out for a few days in the fridge anyway. By the time your tin arrives, it will be ready. As you know, I use all organic ingredients but don't necessarily specify it in every recipe. In this case, I specified organic oranges and apples because their skins are going into it so you can't peel away the pesticides and wax. There is plenty for multiple batches of mince pies (4 dozen pies the size I make), which is good because you're going to want more! Forgot to mention, nobody puts meat in mincemeat these days, but some do use suet. Apologies to my English grandmother and mother, but I'm not heading down to the butcher shop for a piece of suet. I prefer butter. About storage: I've stored a batch of mincemeat in the refrigerator for a couple weeks. For longer storage, I freeze it. If I wanted to store it in the cupboard, I would water-bath can it in pint jars for 25 minutes. Lots of recipes, even by famous English cookery experts, would have you just put the completely cooled mincemeat in sterilized jars, cover with waxed discs, slap the lids on and put them in the cupboard. Delia Smith says, "The mincemeat will keep for ages in a cool, dark cupboard - I have kept it for up to 3 years." Sorry, Delia, love you, but that sounds a bit dicey to me! So order your mince pie tin, make your mincemeat, and come back here next Thursday for the Mince Pies recipe. Okay, are you with me? 1 Scrub the organic, or at least unsprayed, oranges. Cut a bit off the end of each orange. Cut just through the skin in four vertical segments. Remove each segment of skin in one piece. Cut each vertically into strips somewhere between 1/8- and 1/4-inch (about 4 mm) wide, then cut the strips into dice the same size. 2 Measure 1/2 cup (1.75 ounces/48 grams) of the diced orange peel into a 3-quart saucepan. Add 2 cups of water. Bring to boil, and boil gently for 5 minutes; drain. Repeat. 3 Add brown sugar and 1/2 cup (4 fluid ounces/118 ml) freshly squeezed orange juice to the drained peel in saucepan. Bring to boil, and boil gently for 20 minutes. 4 Meanwhile, measure out and chop the dried fruits and almonds. Scrub, but do not peel, the apples. Cut them into dice the same size as the orange peel; measure out 2 packed cups (8 ounces/226 grams). After the peel has cooked in the sugar for 20 minutes, add the diced apples, chopped fruits and nuts and the butter. Stir in the spices and salt. Cook over low heat for about 10 minutes, stirring in the brandy and vanilla extract at the last. 5 Pour into glass storage container or two pint jars. Cool at room temperature, then refrigerate for up to a week. 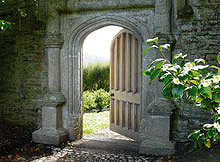 Tregothnan has been at the top of my Next Trip to England Must-Do List ever since I learned of it several years ago. Imagine, tea growing in England! Theirs is a fascinating story you'll want to read on their website. 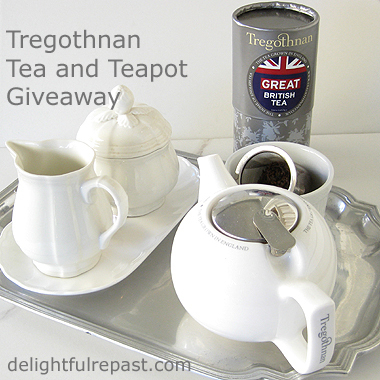 Tregothnan recently sent me their teapot as well as four black tea blends for review. As regular readers might already know, I'm rather particular about my teapots. Of all the faults a teapot can have, the worst, by far, is a dribbly spout. Apparently, Tregothnan shares my view as the teapot designed for them has, in their words, "the best non-drip spout we've ever come across." The Tregothnan Infusion Teapot can, of course, also be used with teabags; but I like that it includes a stainless steel infuser to hold loose leaf tea (I always use loose leaf). Its spout did indeed prove to be non-drip, something I insist upon. When I buy a teapot in a shop, I actually test it (with cold water) on the spot. That has raised a few eyebrows over the years, but frequently a shop owner has concluded that it's a really good idea. It's a small pot, 17 fluid ounces/500 ml (3 teacups or 2 mugs), just right for my solo tea-drinking throughout the day. If others are joining me, I use a larger teapot; I have sizes ranging all the way up to 3 quarts. The first tea I brewed in the teapot was GREAT British Tea, created by Tregothnan for Number 10 Downing Street (Recognize the Prime Minister's address?) in honour of the GREAT Britain campaign. 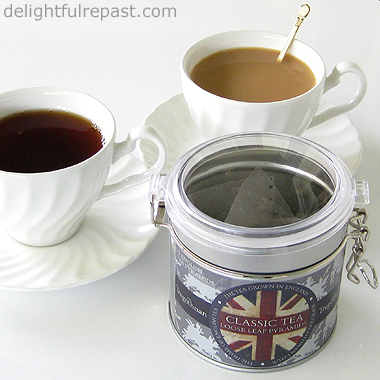 It is a hearty blend of Cornish tea leaves and Assam, making the strongest of their brews. I like to use 3 grams of tea for every 8 ounces of water, so for the Tregothnan pot I used 6 grams of tea, which was 3 level US measuring teaspoons. I did a 4-minute brew. That might be a little stronger than you like if you don't put milk in your tea. Sometimes I drink it plain, and when I use milk it's just a teaspoon or two. No sugar. On my next tea break, I brewed a pot of the Classic tea. After 3 minutes I poured a cup to be tried plain. After another minute I poured another cup--a bit stronger to stand up to a splash of milk (I always use 2%). Then, just for fun, I stirred in 1/4 teaspoon sugar. Wonderful, but by no means necessary. Later I brewed a pot of the Earl Grey loose leaf tea. Earl Grey, one of my favourite teas, can be very good or, more often, very bad. The characteristic bergamot is often overdone (one major brand tastes more like pine cleaner than tea, and I was recently served one with overpowering lavender!). Not the case here. The Tregothnan tea blended with imported Assam has just the right amount of bergamot. The 4-minute brew of this subtle blend was perfect. If you're new to tea, see How to Make a Proper Cup of Tea. If you have any questions, just ask me in the comment section below. I'm always happy to answer tea questions. And if you are in the US, UK or EU, be sure to enter the giveaway! This giveaway is open to residents of the UK and EU as well as the US who are 18 years of age or older. Leave a comment below (one entry per person, please) and please include your email address in the body of your comment. Must enter by 11:59 p.m. Eastern time Wednesday December 9. Winner will be chosen by random drawing and be announced here in the comments before noon Eastern time on Thursday December 10. If I don't hear back from the winner of the random drawing by noon Eastern time Sunday December 13, another drawing will be held and a new winner selected from the original entrants (those who commented before the giveaway deadline). Disclosure: Tregothnan provided product for review purposes and for the giveaway. The views expressed here are entirely my own. I always tell my readers what I really think! Unless you're new to Delightful Repast, you probably know I love really good kitchen equipment. But I also detest snobbery of any kind and am not here to tell you that you can't be a fabulous cook with "lesser" or little equipment. When it comes to fast, accurate temperature readings in the kitchen, ThermoWorks is "The One." That said, my mother and my grandmothers never owned any kind of kitchen thermometer and did very well in the kitchen, thank you veddy much. But I've gotten rather used to relying on a thermometer for certain things and would really hate to be without it. For instance, the organic grassfed meat that I like is so very expensive that I really can't risk it with guesswork. Using a thermometer is the only way I can get perfect results every single time. If you like the idea of simply inserting a probe into the Sunday roast and waiting for the alarm to go off when the desired internal temperature is reached, consider the ChefAlarm (on the left above) with commercial features or the simple and accurate (and less expensive) DOT, both professional grade and built to last. If you like to take the temperature manually from time to time, go with the Thermapen Mk4 or the simple and accurate (and less expensive) ThermoPop. Like the ChefAlarm and the DOT, the Thermapen Mk4 and the ThermoPop are "splash-proof" (moisture-resistant) and designed for the pros. Of course, they're not just for meat. Besides coming in handy for roasting, broiling, baking, grilling and frying, they are indispensable when making candy, jam, marmalade, custard, eggnog and all sorts of things. This giveaway is open to US residents (Sorry, international* friends!) 18 years of age or older. To enter (one entry per person), just leave a comment below. Please include your email address in the body of your comment. Must enter by 11:59 p.m. Eastern time Wednesday December 2. Four winners will be chosen by random drawing and be announced here in the comments before noon Eastern time on Thursday December 3. If I don't hear back from the winners of the random drawing by noon Eastern time Sunday December 6, another drawing will be held and new winner(s) selected from the original entrants (those who commented before the giveaway deadline). 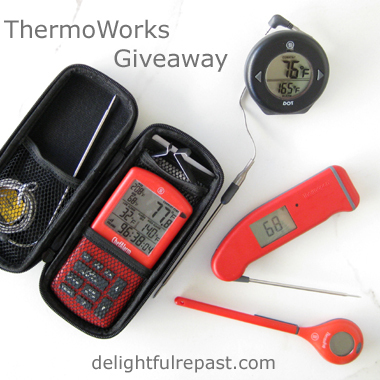 Disclosure: ThermoWorks provided product for review purposes and four items for the giveaway. The views expressed here are entirely my own. I always tell my readers what I really think! 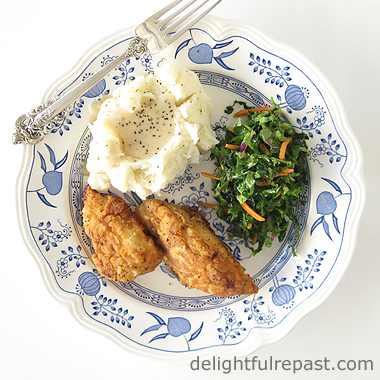 My Southern grandmother made the world's best fried chicken, and I used to make it her way (never turned out as good as hers, of course). But then a few people came into my life who don't like bone-in chicken (or dark meat) and will only eat boneless skinless chicken breasts. 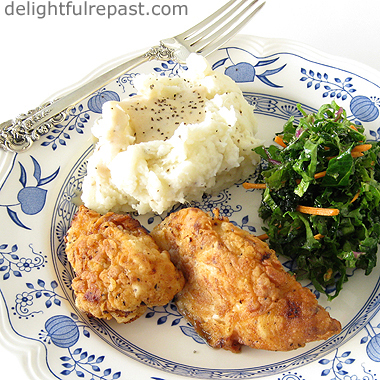 So I had to develop a recipe that would put the flavor of Grandma's fried chicken into bland boneless skinless chicken breasts. Of course, Grandma would be appalled that anyone would not be using the whole chicken. Grandma didn't always just quickly and efficiently cut up a whole chicken. When my father was a boy, she would step out the door of her farmhouse kitchen, grab a live chicken and take care of business, baby! Well, you know I'm all about carrying on family food traditions, but you won't be seeing that here at Delightful Repast! I have a huge skillet that could handle all the chicken in one batch, but then I'd have to use twice as much oil. So I use a 12-inch flare-sided skillet and fry it in two batches. The oil only needs to be about 1/4-inch-deep. No need to deep-fry. Measure the oil into the pan so that next time you'll know how much oil to put in the pan without getting out your ruler. How about you? Do you prefer bone-in or boneless chicken? Dark or white meat? Either is fine with me, as long as there's plenty of Grandma's Cream Gravy! * Pans vary. The first time you make this, measure oil into pan 1/4 cup at a time and use a ruler to measure the depth. Next time, use the same pan and just measure the same amount of oil into the pan; no need to get out the ruler. This may sound overly meticulous, but it will keep you from wasting oil. 1 In 1.5-quart bowl, stir together buttermilk, salt and hot sauce. Add chicken to bowl, cover and refrigerate for 6 to 10 hours. Remove from refrigerator 30 to 45 minutes before coating and frying. That's so the chicken won't be super cold and bring down the temperature of the oil too much. 2 In 8x8x2-inch baking dish, whisk together flour, cornstarch, paprika, pepper, salt, marjoram and thyme leaves. Remove chicken, a few pieces at a time, from the buttermilk and place them in the coating mixture, coating them well on all sides. Place coated pieces on a wire rack. 3 Pour oil into 12-inch skillet to a depth of 1/4 inch. When the oil is very hot,* 350F/180C, use tongs to gently lower half the chicken pieces into the hot oil. Cook for 7 minutes, until golden brown; turn and cook another 7 minutes. During cooking, try to keep the oil between 250F/121C and 300F/149C; this keeps moisture in, and oil out of, the chicken. An instant-read thermometer inserted to the center of one of the larger pieces should register 165F/74C. Drain on wire rack (not the same one that had raw chicken on it, unless you wash it) set in a baking sheet. Blot surface with paper towel. Repeat for second batch, first making sure the oil is up to temperature. You can keep the first batch warm on the wire rack in baking sheet in a preheated 200F/93C oven. * If you don't have a good instant-read thermometer, you need to get one. I use it all the time: oil, caramel, candy, egg mixtures, roasts, steaks, chops, fish, poultry ... You'll wonder how you ever got along without it. 4 Pour off pan drippings, and measure 3 tablespoons back into pan. Stir in flour until smooth, and cook for about 1 minute. Whisk in milk and broth. Turn heat to low and continue stirring until gravy is thickening. Stir in salt and pepper. Continue cooking and stirring until it's the consistency you like. If it's too thick, add milk or broth a tablespoon at a time until it's just the way you like it. Taste and adjust seasoning. Fluffy brown rice is not something I've had very often in my life outside my own kitchen. More often than not, it is sticky, gummy and not very tasty. Someone recently told me of a method meant to ensure perfect results, and I had to laugh out loud! It involved ridiculous amounts of water, treating the rice like pasta. Not necessary, I assure you. I cook it much the same way I make my Mexican Rice, with a few slight changes. Brown rice always takes longer to cook than white, and my method takes even longer; so I always make a huge batch of it to enjoy throughout the week (it reheats beautifully in the microwave). The only way to get consistent results with any rice recipe is to use the same rice and the same pan each time--especially when making a large quantity. 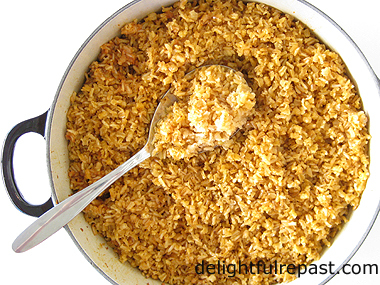 So once the recipe comes out to your liking, always use the same rice and the same pan. I perfected my recipe using Lundberg organic long-grain brown rice and a 5 1/2-quart Le Creuset Round French Oven. * This amount of tomato sauce or crushed tomatoes will not result in a tomato-y rice; that is not the point. It is just enough to add "a certain something" to the flavor. 1 In 3-quart saucepan, bring broth, water and salt to a simmer while browning the rice. 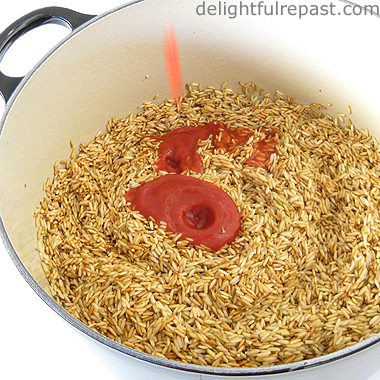 2 In 5 1/2-quart pot, heat olive oil and stir in rice (straight from the package--do not rinse). Cook over medium heat, stirring occasionally, until rice is golden brown. This may take 20 to 30 minutes; don't rush it. Note: If you've made pilaf before, the rice is sauteed just until translucent. I want you to go waaaayy beyond translucent. 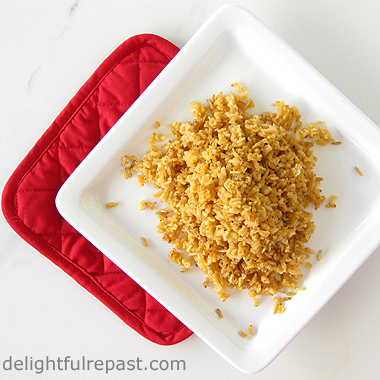 I want you to toast this rice to a nice golden brown like in the photo below, and that takes some time (which is why I make big batches of rice). 3 Gradually stir tomato sauce into rice and cook for 2 minutes, then add hot broth to rice. Bring to a full boil and stir just once. Put the lid on tightly, turn the heat down low and leave undisturbed for 45 to 50 minutes. Note: If this is your first time making this, take a really quick peek to see if liquid has evaporated and rice is done. If not, put the lid back on and continue cooking for 5 minutes. 4 Cover and let stand, off heat, for 10 minutes. Fluff gently with a fork, inserting your fork at the edge of the pan and fluffing toward the center, going all around the edge of the pan. Garnish, if you like, and serve. Ever since I heard that at Ladurée in Paris they blend hot chocolate with an immersion blender to make it really frothy just before serving, I knew I had to have an immersion blender. But by the time I got the immersion blender my chocolate mood had passed and has only just now returned. You see, generally speaking I am not a chocolate fan. But when the mood does strike, nothing else will do! 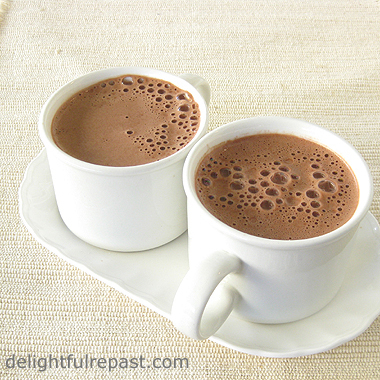 And one of the chocolate things I enjoy is a good not-too-sweet hot chocolate. An "adult" hot chocolate, if you will. Since I'm contemplating experimenting with dairy-free for a couple of months at some point, I thought I'd make my hot chocolate with rice milk. Of course, you can use regular milk and even add more sugar, if you like. And you might want to leave out the Kahlua or coffee. There is only one thing you can't change about this recipe. 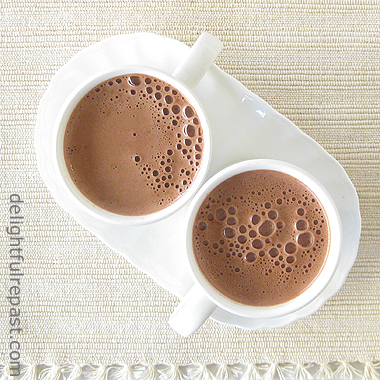 You must froth the chocolate with an immersion blender for one minute and serve immediately. I've made hot chocolate with rice milk before, and it seemed rather thin. Not this. The immersion blender gives the hot chocolate a texture I can only call "plush." Have you tried it? If not, give it a go and let me know what you think. 1 In 1-quart saucepan, combine all ingredients, cooking and stirring until hot. Turn off heat. 2 With immersion blender, blend hot chocolate for 1 minute. It will be very frothy. Note: If you are multiplying recipe to make 2 or 3 servings, use a 2-quart pan. For 4 servings, step up to a 3-quart pan because the immersion blender will really expand the contents of the pan. 3 Pour into mug(s). Enjoy. A classic custard tart is pure comfort food. 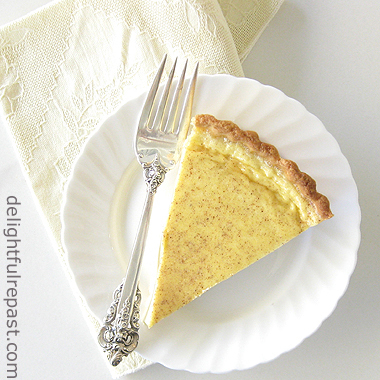 A not-too-sweet, nutmeg-dusted custard baked in a slightly sweet shortcrust pastry shell, this was a family favorite when I was growing up. It pairs perfectly with a cup of tea. Though, of course, it's a dessert, I've always thought it makes a splendid breakfast. When I add a bit of brandy, I call it Eggnog Tart. Come winter, I do love a good Eggnog! But you can leave out the brandy and have a perfectly lovely Classic Custard Tart. Sometimes I think how nice it would be to be one of those people who aren't really into food but just see it as fuel for the most part. That would make it easier to eat for health and to maintain ideal weight. But I can't imagine my life without my love of food and my treasured memories of cooking with my mother and grandmothers. When I was a child, unless my grandmothers were around, custard tarts and pies would be replaced on the menu with simple, crustless individual baked custards. I remember being home from school with a cold or flu and living on those custards for days at a time when nothing else suited. If you prefer to skip the crust, be sure to bake it in a water bath and in a different pan -- a loose-bottomed tart tin will not hold liquid! Which reminds me of a good question: What is your worst kitchen disaster? Tell me yours, and maybe I'll tell you mine! * Note: When using the 2 tablespoons of brandy, I use 2 tablespoons less of the milk. That way I have the exact amount of filling needed. 1 Add flour, powdered sugar and salt to work bowl of food processor; turn on for about 3 or 4 seconds to combine. Add chunks of butter; pulse to a crumb texture. Add egg yolk and cream; pulse until the dough starts clumping together. This is to be a crisp, more cookie-like crust, rather than a flaky pastry; so there's not quite the concern about over-processing. Flatten slightly into a 4- to 6-inch round disc, wrap and refrigerate for 30 to 60 minutes. 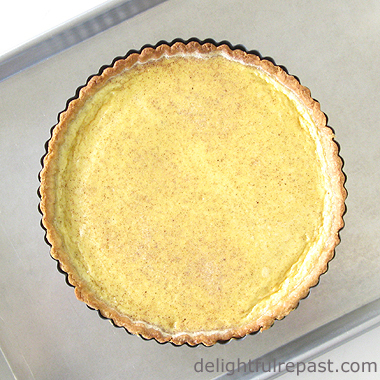 2 Lightly butter a 9-inch/23cm tart tin and set it on a baking sheet. On lightly floured 12-inch square of aluminum foil, roll out the pastry to a 12-inch circle. Transfer dough to tart tin, pressing dough (but not stretching it) to fit the tin. Save the foil; you're not done with it. With scissors or knife, trim the overhang to 1/2 inch all around. Fold it in and press it to the sides to form a thicker side crust. Trim the edges by rolling the rolling pin over the top. Press the pastry into the flutes so that it rises a bit above the edge (in case of shrinkage). Pop it in the freezer for 15 minutes while you preheat the oven to 375F/190C/Gas5. 3 Cover chilled pastry with reserved piece of foil, clean side up, pressing it to fit well. Spread 2 cups of ceramic pie weights (that's two packages of Mrs. Anderson's ceramic pie weights) over the foil. Bake for 15 minutes. Remove foil and pie weights (called baking beans in the UK); continue baking for 10 minutes, until lightly browned to a pale golden. Let stand to cool. 4 While pastry is cooling, make the filling. In 1-quart saucepan, heat milk and cream to a simmer. 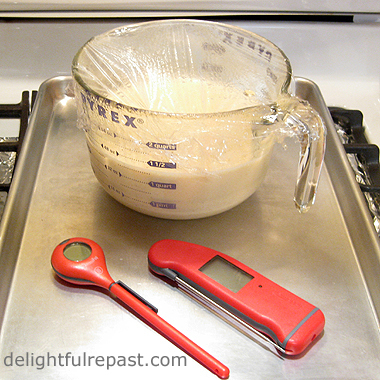 In 1-quart glass measure, whisk together eggs, sugar, brandy, vanilla extract, nutmeg and salt until well combined. Gradually whisk in hot milk and cream. Strain back into pan and then, because it has a pouring spout, back into the glass measure. Let stand until pastry is ready. 5 Turn oven temperature down to 325F/165C/Gas3. Pour filling into prebaked pastry shell. Bake (with tart tin on baking sheet) for about 25 minutes, until just set and still with a bit of a wobble in the center. Cool to room temperature, about 1 hour. Remove from tin. Serve at room temperature or chilled. With (below) or without (above) a dollop of brandy and vanilla whipped cream. 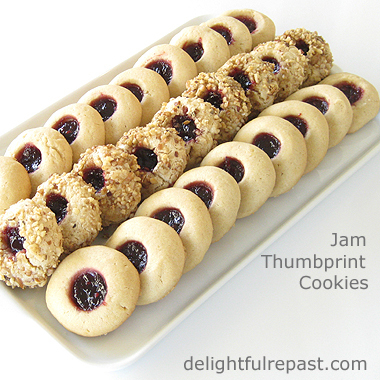 Doesn't everyone have fond memories of jam thumbprint cookies? And those of us who grew up with British baking also remember jam tarts. These cookies are much like jam tarts, only less fiddly to make, even with the optional added step of rolling the dough balls in egg whites and nuts. I like to make half with nuts and half without. 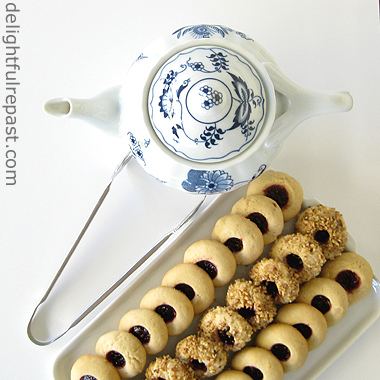 Filled with red jam, they look quite festive and make a colorful addition to the tea table. I made these with blackberry jam, which lacks the jewel-like appearance of the red jams, but it tastes really good. The jam firms up as they bake, so the cookies actually stack quite well if, for example, you wanted to fill a tin with them for gifting. And they can be frozen for up to a month. They're really good with apricot preserves, too, but the preserves need to be heated (to thin), strained and cooled first. 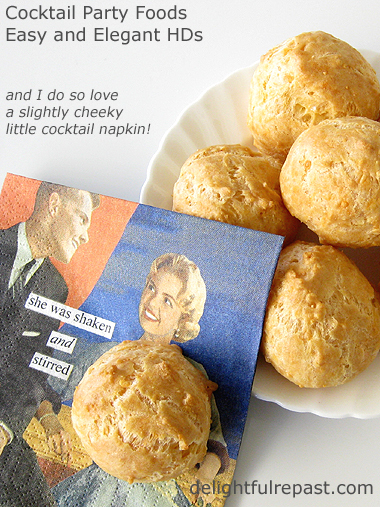 They go splendidly with a cup of tea which, as you probably know, is a must for anything I bake. What cookies will you be baking? 2 In the bowl of a stand mixer fitted with the flat beater, cream butter and sugars* on medium speed for 2 minutes, or until very light and fluffy. Add egg yolks and vanilla extract; beat on medium speed for 1 minute. On low speed, mix in the flour, beating until just combined. Cover and chill for 1 hour. * Tip: Be sure there are no hard lumps of brown sugar that go unmixed because they will be visible in the finished cookie and spoil its appearance. 3 Using a #60 scoop, scoop dough onto baking sheet. Then go back and roll each scoop into a smooth ball. For the nut-coated* option, roll each ball first in slightly beaten (until frothy) egg whites, then in chopped nuts. Place 3 inches apart on baking sheet. Note: You will get precisely 36 cookies if you use a #60 scoop, packed and leveled. * Of course, you could probably achieve the same crunchification by simply mixing the nuts into the dough. But then what you do with those egg whites?! 4 With thumb (I use the end of the handle of a wooden honey dipper dipped in flour each time), make an indentation in the top of each cookie about 1/2 inch wide and 1/2 inch deep. Carefully spoon 1/4 teaspoon of jam into each indentation. 5 Bake for about 15 to 17 minutes, or until edges are lightly browned. Cool on wire racks. Store in airtight container at room temperature for up to 1 week. May be frozen for up to 1 month. 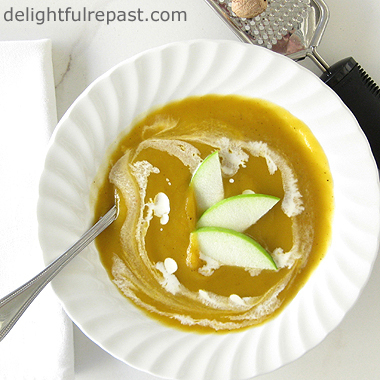 Butternut Squash Soup is the quintessential soup of autumn, and despite a spell of hot weather, I've been feeling positively autumnal. When I see this soup on a seasonal menu, I'm always tempted. But then I hesitate because too often it's made in one of two ways that I don't like. One extreme is a version overloaded with garlic and strong herbs, trying too hard to not be the other extreme I don't like. And that is one that borders on dessert, very sweet and pumpkin-pie spicy. I add just a tiny amount of nutmeg, allspice and real maple syrup to enhance the natural sweetness of the squash and the tartness of the green apple. A bit of potato amps up the creamy texture even without any actual cream. And using an immersion blender to puree the soup is the only way to go. Ladling part of it into a countertop blender and then pouring it into yet another bowl or pot, and then repeating two or three times ... well, all I have to say is I can't believe I waited so long to get an immersion blender. Of course, you can use chicken stock rather than vegetable stock and even put in some bacon, but I like the pure vegetable flavors of this version. What could be better than a steaming bowl of soup and homemade bread with lots of butter on a crisp autumn day! What are your favorite soups? 1 Preheat oven to 400F/200C/Gas6. Line a baking sheet with foil. Cut off stem of squash, and cut squash in half lengthwise. Scoop out seeds. Place cut side up on prepared baking sheet, and brush tops with melted butter. Sprinkle with 1/8 teaspoon each salt and pepper. Roast for 1 hour. Let stand at room temperature until cool enough to handle. 2 In a 4-quart pot, heat olive oil and add chopped* apple, onion and carrot. Sprinkle with 1/8 teaspoon each salt and pepper; cook for about 8 minutes. Scoop cooled squash into the pot. Add potato, broth, water and seasonings, including another 1/4 teaspoon each salt and pepper. Bring to a boil, reduce heat and simmer, loosely covered, for 40 minutes. * Roughly chopped is fine because you'll be pureeing the soup. 3 Using an immersion blender, puree the soup in the pot. Stir in the maple syrup. Taste and adjust seasoning. Note: I'm not saying life without an immersion blender was meaningless or that I'm consumed with bitterness and regret for not getting one sooner. But seriously, folks, if you don't have an immersion blender, get one now. You'll wonder how you got along without it! 4 Ladle soup into bowls, garnish and serve.